LAST CALL! WILLA CARSON DOUBLE FEATURE FREE! Looks like the retailers are offering you one last chance to begin reading the best mystery thriller series you haven’t started yet! 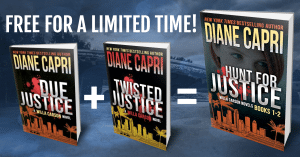 Get the special edition HUNT FOR JUSTICE: Judge Willa Carson Books 1-2 for FREE! Of course, double check the price before you purchase, but you should find the Double Feature FREE at Amazon Kindle, Apple Books, Nook, Kobo, and Google Play. 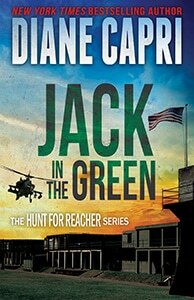 Hunt for Justice features Due Justice, the first novel in the Judge Willa Carson Series, and Twisted Justice. Get them both FREE now, before the limited-time sale offer expires! I hope you take advantage of this offer, because it won’t last long! If you like to read a twisty, clever “who done it” that will have you scratching your head until the end is revealed, Night Justice and Judge Willa Carson are for you. She killed a man. Or did she? 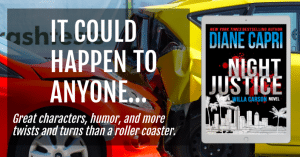 USA Today bestselling Judge Willa Carson returns in this fast-paced mystery filled with great characters, humor, and more twists and turns than a roller coaster. Driving home after a long, exhausting work week, Judge Willa Carson is horrified when she hits a man with her car. She jumps out to help, but it’s too late. He’s not breathing and she can’t revive him. Famous Restaurant Owner’s Wife Kills Pedestrian is the top click bait headline for every citizen journalist with a smartphone video looking to make it big on social media. You can pre-order Night Justice HERE.